Joseph Ginat, one of the 669 mainly Jewish children saved from the Nazi death camps by Sir Nicholas Winton, is lost in thought as he catches the Winton train in Prague yesterday. Watching a steam train full of waving passengers pull out of Prague station yesterday, the Meisl brothers recalled the wartime journey that had changed their lives forever. 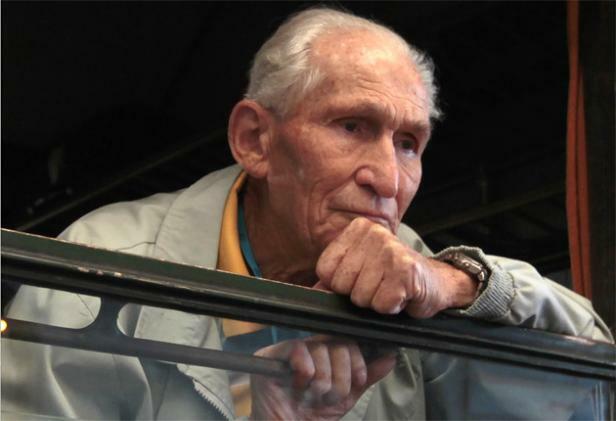 Peter Meisl was evacuated from Czechoslovakia by a British stockbroker, Nicholas Winton, on the eve of the Second World War along with 668 other children, 22 of whom were on board the commemorative train yesterday as it left Prague in a cloud of steam to begin its four-day trip to London. Czechoslovakia’s Nazi occupiers declared Peter’s brother Jiri too old for evacuation and, as Peter lived out the war quietly in Wales, Jiri and their parents were forced on to a prison train and sent to Auschwitz. Their father, like the relatives of scores of ”Winton’s Children”, perished there. The Meisls’ story is just one of dozens of extraordinary tales from the now elderly men and women who owe their lives to Winton. As the former evacuees gathered in Prague for their train journey, they hailed his compassion and determination, celebrated their survival and mourned for those children that were not able to escape. In December 1938, 29-year-old Winton was packing for a skiing holiday in Switzerland when his would-be holiday companion told him to come urgently to Czechoslovakia instead. Adolf Hitler’s forces had occupied the country’s Sudetenland, and Winton was appalled to see the conditions in which the refugees were living. In other parts of central Europe, ”kindertransporten” were already evacuating children, but Czechoslovakia had no such programme. Winton immediately started raising money and organising trains to save the children, and on his return to Britain began finding homes and organising visas for them, all while holding down his day job in London. Word of Winton’s audacious plan quickly spread throughout Prague. When he returned to the Czech capital and set up office in his hotel room on Wenceslas Square, long queues soon formed outside of parents who would plead with him to take their children to Britain. Between March and August 1939, eight Winton trains carried 669 children – most of them Jewish – to safety in Britain. Seventy years on, as the steam train whistled its impending departure, they recalled parents telling them that they were just going on a short holiday, the excitement of the older children and the bewilderment of the younger ones. They remembered their strange first impressions of Britain, spitting out a first sip of milky tea and their wonder at white sliced bread. ”Our parents put a brave face on things, and of course they didn’t know that they wouldn’t see their children again,” said Lady Milena Grenfell-Baines, who was sent to a family in Lancashire and still lives in Preston. ”It is very unreal and very emotional to be here today. It’s like a film set,” she said, as Czech government ministers prepared to unveil a statue to Sir Nicholas. He did not even tell his wife about his exploits until the late 1980s, when she found a scrapbook of clippings in the attic of their home in Maidenhead. The scrapbook was passed to a Jewish historian and, before long, he was being introduced to some of the people he had saved, on Esther Rantzen’s That’s Life. Having previously been awarded only the Freedom of Maidenhead, Winton was now described as ”Britain’s Oscar Schindler” and the ”Pied Piper of Prague” and he was knighted in 2003. Four years later, the Czech Republic gave him its highest honour and nominated him for the Nobel Peace Prize.